Stefin B antibody LS-C696211 is an FITC-conjugated mouse monoclonal antibody to rat Stefin B (CSTB / Cystatin B). Validated for WB. 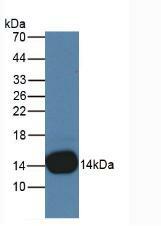 Western Blot; Sample: Rat Placenta Tissue.